From Argentina to Dubai, these stock markets have produced double-digit returns so far this year. Argentina is living on borrowed time, but the nation's stock market has been on a tear this year. The benchmark Mercado de Valores de Buenos Aires (Merval) has gained 47% since January, making it the top performer in a group of 40 global stock markets researched by Bespoke Investment Group. That may come as a surprise, given the recent headlines out of Argentina. Argentine stocks went into freefall in June after the U.S. Supreme Court declined to hear an appeal of an earlier decision by a federal judge that required Argentina to pay certain bondholders in full. The move raised worries that Argentina could default on its debts for the second time since 2001. Meanwhile, the Argentine economy recently slipped into recession, and the peso has depreciated sharply versus other major currencies. 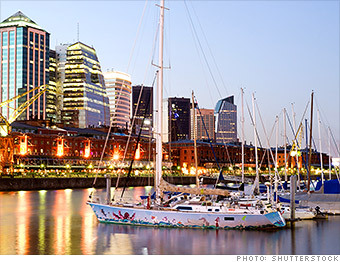 So why is Argentina the top performing stock market in the world? "There's been a general rotation out of safety and into risk," said Paul Christopher, chief international strategist Wells Fargo Advisors. "In particular, the countries that had most attractive valuations have been the most bought this year." With interest rates at historic lows in the United States, money has been flowing into emerging markets as investors look for growth opportunities. But investors might be getting a little carried away, warns Christopher. "Low interest rates in this country has pushed money in places it probably shouldn't have gone," said Christopher.